From the simplest couplet to the mind-boggling pantoum, the award-winning team behind A POKE IN THE I shows us the many fascinating ways poetic forms take shape. 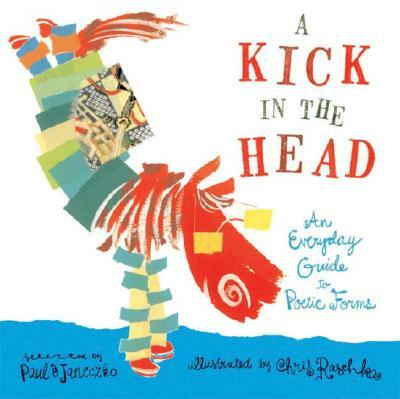 In this splendid and playful volume, acclaimed poetry anthologist Paul B. Janeczko and Caldecott Honor illustrator Chris Raschka present lively examples of twenty-nine poetic forms, demonstrating not only the (sometimes bendable) rules of poetry, but also the spirit that brings these forms so wonderfully to life. Featuring formal poems, some familiar and some never before published, from the likes of Eleanor Farjeon (aubade), X. J. Kennedy (elegy), Ogden Nash (couplet), Liz Rosenberg (pantoum), and William Shakespeare, the sonnet king himself, A KICK IN THE HEAD perfectly illustrates Robert Frost's maxim that poetry without rules is like a tennis match without a net.